The family room is one of the most important rooms in your entire home. It’s where everyone gathers to hang out, relax, watch TV, and generally spend quality time together. 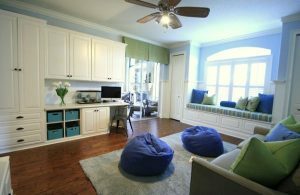 As such, you want to create a space that’s cozy and inviting for everyone, including young children and toddlers. Toward that end, here are some tips for designing a fun and kid-friendly family room. Comfortable furniture is a must for any family room, and yours is no exception. Start with a main piece, such as a sofa or sectional, and add accessory seating around that. Foam sacks work particularly well here, since they come in a variety of shapes and sizes and do not harbor any sharp edges that can cause injuries to energetic kids. Make sure you provide enough seating for everyone in the family as well as some extras for the occasional playdate guests. You might be tempted to go with hardwood floors because of the ease of cleaning up spills, but that’s neither very toasty (think cold feet in winter) nor very safe if a toddler takes a tumble. Consider installing carpeting and using throw rugs or area rugs over the carpeting as extra protection against accidents of all kinds. Books, board games, toys, and DVDs should be readily available in the family room, which means adequate storage is important for keeping things tidy. Plastic bins and shelving placed at child height will allow kids to make their own entertainment choices and encourage them to pick up after themselves. The family room is no place for bare, boring walls, so don’t skimp out on artwork. Instead, use this prime real estate to showcase framed individual or family photos as well as children’s drawings or craft projects. Since different activities require different levels of lighting, we recommend ceiling lights that can be adjusted with a dimmer switch. Turn the lights all the way up for ordinary activities, and then dim them for movies or video games on the big screen. You can also add table or desk lamps for individual activities such as homework or reading. The family room should be a welcoming space that is open to toddlers and young children as well as teens and adults. Help make this a reality by using the above suggestions to design a fun and kid-friendly area that’s perfect for family bonding time.